The famous pilgrimage of Lord Shiva’s Dham, Kedarnath has been opened for the next six months. Let’s know these 8 major things of Shiva’s Dham. The temple of Kedarnath is at an elevation of 3593 feet. How this temple was built at such a height, it is still considered a miracle. It cannot be imagined today. Puja of the temple is considered to be one of Kartaratha Dvashash Jyotirligs. There is no authentic mention of who built the temple, but yes it is also said that it was founded by Adi Guru Shankaracharya. Puja of the temple is considered to be one of Kedarnath Dwadash Jyotirling. In the morning, the Shivji-Nanda is naturally bath and it is ghee-coated on it. Thereafter, aarti is being lit by burning incense in the sun. At this time travelers and Ganas can enter the temple and worship them, but in the evening god is made to be done. They are decorated in a variety of sparkling manner. The devotees can only see it from a distance. The priests of Kedarnath are the only Jangala Brahmins of Mysore. Shankar bull is worshiped in Shri Kedarnath as a figure of the back. It is believed that when Lord Shankar took the form of a bull, the upper part of his body appeared in Kathmandu Nepal. Now there is a temple of Pashupatinath. Shiva’s arms appeared in Tungnath, in the mouth Rudranath, Nabhi Madamadeshwar and Jata Kalpeshwar. Therefore, in these four places, Shri Kedarnath is said to be a Panch kedar. Here are the magnificent temples of Shivaji. During the visit, the temple of Kedarnath ji opens to the general devotees at 7:00 p.m. Special Puja is done from one to two o’clock in the afternoon and after that the temple is closed for relaxation. Again the temple is opened for public viewing at 5 o’clock in the evening. By making a statue of the five-headed Lord Shiva duly making it, regular aarti takes place from 7:30 to 8:30. At 8:30 p.m, the temple of Kedareshwar Jyotirling is closed. In winter, Kedarghati is covered with snow. Although the opening of the Kedarnath temple is started, but it usually closes before the 15th of the month of November and after six months, ie Vaishakha (13-14 April) the kapat opens. In such a situation, the Panchvata statue of Kedarnath is brought to ‘Ukhimath.’ The statue is worshipped also here by Raval ji. 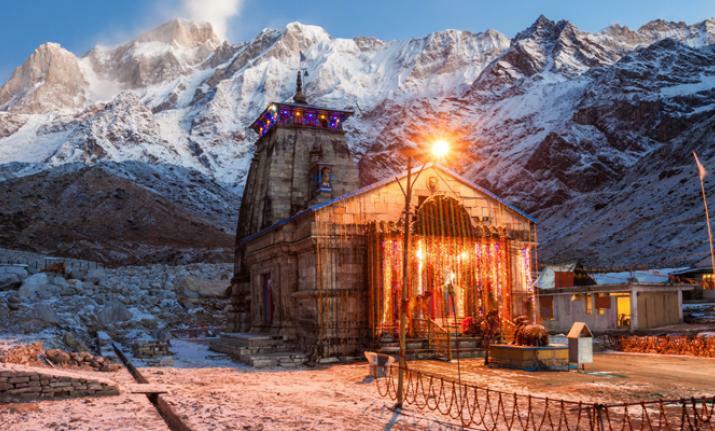 In Kedarnath, the public receives the receipt by depositing the fees and accordingly he performs the puja-aarti of the temple or receives the offerings. Pali in the worship of God, Mahavishak Pooja, Abhishek, Short Rudrabhishak, Shodshopachar Poojan, Ashtapachar Poojan, Sampri Aarti, Pandava Pooja, Ganesh Pooja, Shri Bhairav ​​Pooja, worship of Parvati ji, Shiva Sahastranam etc. are the chiefs of this Jyotirlinga. The history of establishment is summarized in the Himalayas on Kedar Shringa, the incarnation of Lord Vishnu, Mahapatva Nar and Narayan Rishi used to perform penance. Lord Shankar appeared pleased with his worship, and according to his prayer, he gave the bride to be eternally in the form of Jyotirlinga. This place is situated on Kedar, the Kedarnath mountain range of the Himalayas. The story of Panchkedar is believed to be that when Pandav was victorious in the battle of Mahabharata, Pandavas wanted to get freedom from the sin of fraternal. For this, he wanted to get the blessings of Lord Shankar, but he was content with those people. Pandavas went to Kashi for the visit of Lord Shankar, but they did not find him there. Those people came to the Himalayas while searching for them. Lord Shankar did not want to see the Pandavas, so they went from there to Kedar and settled there. Pandav, on the other hand, was also strong enough to persevere, and he followed Kedar after him. Lord Shiva took the shape of the bull by then and then gets included in other animals body. Pandavas had become suspicious. So Bhima took his huge form and spread the legs on two hills. All other cow-bulls left, but Shankarji’s bull was not ready to go under the feet. Bhima fastened on this bull, but the bull fell into the ground. Then Bhima caught the body of the triangular back of the bull. Lord Shankar was pleased to see the devotion of Pandavas, the firm resolve. He gave immediate visions and liberated the Pandavas. From that time it is worshiped in Shri Kedarnath as the shape of the back of Lord Shankar Bull.